[ Henry Richmond Droop, Victorian Mathematician. ] Autograph Letter Signed ('H. R. Droop') [ to E. Meyrick Goulburn, Dean of Norwich ], presenting a copy of his book 'The Edwardian Vestments', and discussing its contents. With the book itself. Letter: addressed from 1 New Square, Lincoln's Inn [ London ]. 1 February 1882. Book ('Reissued with supplementary notes. '): Published in London by Hatchards, Piccadilly, 1876. LETTER: 8pp., 12mo. On two bifoliums. In good condition, lightly aged, and tipped-in onto the half-title of Item Two below. [ George Richmond, portrait painter, one of William Blake's 'Ancients'. ] Autograph Letter Signed ('Geo Richmond'), offering to begin a drawing after Christmas, as he regards 'all holy days as very sacred things'. 10 York Street, Portman Square [ London ]. 3 December 1851. 1p., 12mo. In good condition, lightly aged. He begins: 'Any time after Jany 7th will suit me perfectly for making the drawing, before Xmas day I am afraid I could not begin it.' He has 'too great fellowship with those who labor, not to respect all holy days as very sacred things'. On letterhead of 'The Countryman', Editorial Office, Burford, Oxford. 21 April 1947. 1p., landscape 12mo. In fair condition, lightly aged and worn. The letterhead indicates that at the time of writing Fitter was one of the magazine's two assistant editors. He thanks him for his congratulations, but points out that he has 'actually been here for nearly a year now, but we did not move over here to Burford till the end of last month'. He hopes that '"Mayfair" is flourishing', and asks him to look in if he is ever passing that way again. [ Hon. Henry Erskine, Lord Advocate for Scotland. ] Autograph Letter Signed ('Henry Erskine'), to John Cockburn Ross, regarding Cathcart and 'the Richmond Scenery'. 2pp., 4to. Bifolium. In fair condition, lightly aged. Reverse of second leaf, with part of red wax seal and Keswick postmark, addressed to Ross at Tadcaster, and forwarded to the Crown Inn, 'Harragate', Yorkshire. He begins by explaining that a delay to his departure for Scotland is the reason for the late reply. 'To morrow or next day we shall set out. The moment I reach Edinburgh I shall see Cathcart & immediately write you most minutely every thing regarding the Richmond Scenery | All this Party send you their best Compts. Lascelles bought Lichfield House in 1729, and committed suicide there in 1753. The enormous success of Braddon's novels 'Lady Audley's Secret' (1862) and 'Aurora Floyd' (1863) allowed her to buy Lichfield House, where she too died. It was demolished in the 1930s. ONE: Manuscript indenture on vellum. 'Mrs. 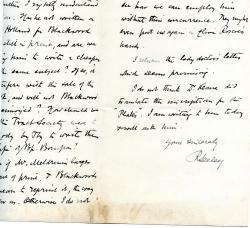 M. E. Maxwell to G. M. Maxwell Esq | Conveyance of freehold property known as "The Homestead" Sheen Road Richmond Surrey'. 10 June 1914. 4pp., 8vo, with covering page. Laid out in usual fashion, bound with green ribbon with tax stamps, Land Registry stamp, and two seals in red wax. [Lawrence Dundas, 1st Marquess of Zetland.] Thirty-three Autograph Letters Signed (all 'Zetland') to the portrait painter Shirley Slocombe. With eight letters from Lady Zetland, and drafts of two of Slocombe's letters and two accounts by him. Twenty-two on letterhead of Aske, Richmond, Yorkshire; eight on letterhead of 10 Arlington St, London SW. The other eleven from various addresses. Between 1897 and 1911. The collection is in good condition, on lightly-aged paper. Zetland's letters total 26pp., 8vo; 19pp., 12mo; 1p., 16mo. The theme is the painting and engraving of a portrait of Zetland by Slocombe, and the correspondence casts an interesting light on the relations between patron and artist in late nineteenth-century England, with the drafts of Slocombe's two letters, and his accounts for painting and engraving, adding to its value. Manuscript Letter from William Walker & Co. in Sydney, Australia, to William Kerr of Richmond, Virginia, regarding the state of the Australian tobacco trade and 'unfavorable' prices fetched by consignments of his tobacco. Marked 'Per Caledonia', with ship's name altered to 'William Hyde'. 1p., 4to. The second leaf only of a bifoliate letter. Addressed on reverse to 'William Kerr Esqr. | (of Richmond - Virginia) | Care of Messrs Gilmour & Kerr | Glasgow | NB'. An accompanying typed note identifies the postal features as follows: 'Postage: - 3d. pre-paid. Colonial outward Ship Letter rate. | 8d. to collect. Private Ship Letter rate. | Handstruck Marks: - PAID SHIP LETTER SYDNEY AP+21 1847 in red. (SL 3, var. 1 - early use.) | NN 29AU29 1847 in red. [George Richmond, English portrait painter, disciple of William Blake.] Two Autograph Letters Signed (both 'Geo Richmond') to 'Lilian', in the first speaking of a 'bond between us', and in the second discussing a 'print & frame'. Both on letterhead of 20 York Street, Portman Square [London]. 2 November1882 and 7 July 1885. Both in good condition, on lightly-aged paper, and both with a mourning border (the first thick and the second thin). ONE: 3pp., 16mo. He apologises for 'having neglected to answer' her 'too kind and pretty note'. 'And really such neglect does great injusticce to my feeling, for your note brought back to me in vivid recollection, a visit to when we were both in great sorrow, which I am sure was a bond between us, though we had our games of Whist in the Evening with your Aunt Laura & Mrs. Buchanan!' TWO: 2pp., 16mo. He is glad she likes 'both print & frame'. [John Lawson Petingale, artist.] Autograph Letter Signed ('J. Lawson Petingale') to the architect Sir Albert Richardson. Together with a copy of the Ealing Arts Club magazine 'Miscellany', inscribed to Richardson. Letter: From 4 Birkbeck Way, Greenford, Middlesex. 23 December 1956. Magazine: 'Published by the Editors' (same address). No. 9. 1956. Letter: 2pp., 8vo. In very good condition, on lightly-aged paper. Addressing his letter to 'Dear Sir Albert', Petingale thanks Richardson for his letter 'arising out of your visit to the Ealing Arts and Crafts Exhibition', which has encouraged Petingale to send him 'the latest number of "Miscellany", which is the contribution of the Literature Group to the Ealing Arts Club, and which my wife and myself have been editing for the last nine years'. He discusses a visit to Holy Cross Church, designed by Richardson. [Pamphlet] The Birth-Day Commemorated: A Sermon, preached in the Vineyard Chapel, Richmond, on Sunday Evening, November 17th, 1839. Richmond, [Surrey], Printed and Sold by W. Offord, Church Court, 1839. 15pp., 12mo, sewn as issued, foxing, small stain and small unopened tear on first page, mainly good. Inscribed to a Miss Smith by a Mr Smith. No copy on COPAC/WorldCat, but apprently the sermon was reprinted with a memoir of H.B. 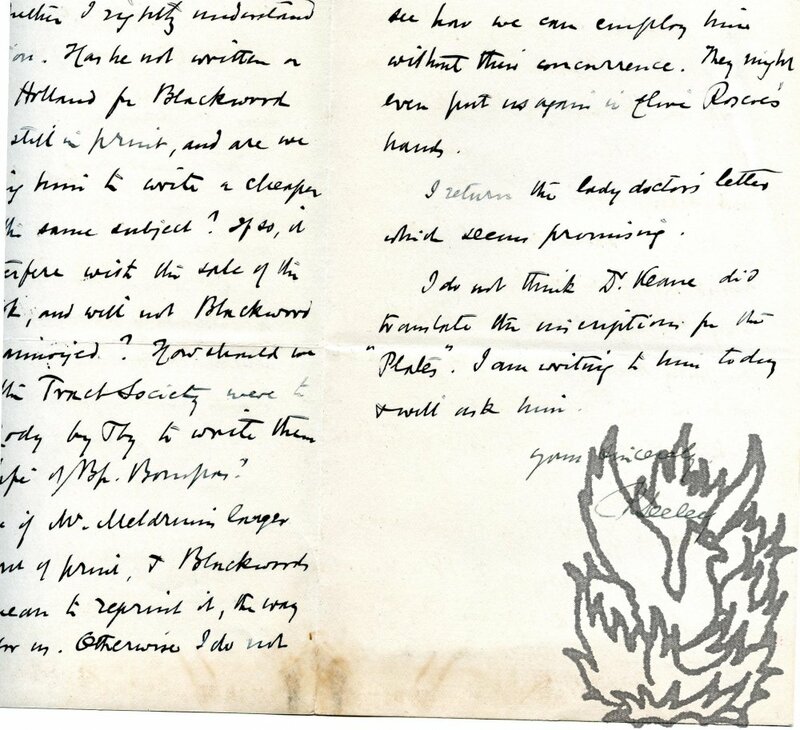 Martin in 1845 (copy only in BL). On letterhead of the India Office, Whitehall. 24 October . 1p., 12mo. Good, on lightly-aged paper. Tipped in onto a leaf removed from an album. Holderness's predecessor Sir Richmond Ritchie (1854-1912) had died ten days before the writing of the letter, as a result, according to the Oxford DNB, of the undermining of his health by 'unremitting hard work [...] over several years'. Holderness begins the letter: 'It is very good of you to congratulate me on succeeding to poor Ritchie's responsibilities. Autograph Letter Signed ('A Berry') from Agnes Berry, sister of the poet Mary Berry and friend of Horace Walpole, to the Berry sisters' landlady the Hon. Mrs George Lamb of Richmond, describing Mary Berry's ill health. Curzon Street, London. 7 December [1840s?]. Autograph Manuscript Signed ('M Berry') by the diarist Mary Berry, sister of Agnes Berry and friend of Horace Walpole, a flight of fancy headed 'Devonshire Cottage to its well-beloved Mistress [Hon. Mrs George Lamb], Greeting -'. [Devonshire Cottage, Richmond.] 29 June and 1 July 1844. 4pp., 12mo. 75 lines. On bifolium. Very good, on lightly-aged paper. The entire document is in Mary Berry's autograph. The letter proper, of 57 lines, is signed 'Devonshire Cottage / a true Copy / M Berry', the joke, such as it is, being that Mary Berry has copied out a document written by Devonshire Cottage itself to its owner, the Hon. Mrs George Lamb (Caroline, or 'Caro George' Lamb, from whom the Berry sister's were leasing it). 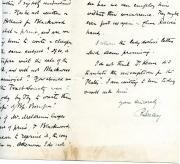 Autograph Letter Signed ('R Seeley') to his business partner Service. 5 February 1908; Holmbury, Epsom. 12mo, 3 pp. Bifolium with mourning border. Good: lightly aged and with a slight bloom at the foot. Text clear and complete. Written to a business partner, and providing an insight into the everyday workings of the Edwardian book trade. The beginning of the letter appears to be a response to suggestions by Service of authors to write a book on Holland. Begins 'Dear Mr. Service, | We cannot employ Clive Holland again until he has at least put his "Egypt" into a shape in which we can venture to reprint it. Fragment of Autograph Letter Signed to unnamed correspondent. British evangelical divine (1772-1827) and author. Slip of paper roughly seven and a quarter inches by two. Discoloured and heavily creased. Stitched to larger piece of paper. Reads '<...> & thereby lengthen the period for the cultivation of acquaintance amongst us. Give my sincere regards & grateful acknowledgments for past kindness to your family: with true esteem & love from all here & believe me, | faithfully & affecty. yours | Legh Richmond'. Son (1811-93) of the essayist (1778-1830), and editor of his works. Three pages, 12mo. Stained and grubby. Docketed, with date on blank reverse of second leaf of bifoliate. He will be pleased to see the portrait which his correspondent describes. 'I very well remember that there was a chalk portrait by Bewick which would seem to be that you mention and there was an engraving of it in the life of my Father which I wrote some short time after his death & I do not remember whence that impression was derived. Autograph Note Signed to [Walter Sydney] Sichel. 4 December 1888; on card with letterhead of the Beefsteak Club, King William Street, Strand, W.C.
English actor (1843-96) under the name 'Arthur Cecil'. 1 page, dimensions 3 1/2 inches by 4 1/2 inches. In good condition though dusty. He thanks him for his kind note, and says that if he 'may keep my little contribution in reserve for a bit' he 'will certainly bear it in mind & shall hope to turn you out something before very long'. Signed 'Arthur C Blunt'. English architect who built a bridge over the Thames at Richmond. Relates to the lease by him to Graham of property in Queen Street, Mayfair. Signed and sealed by both parties. On the reverse is an assignment of 7 December 1847 from Graham to Elizabeth Anne Howard of 12 Thurloe Square, Brompton. With various seals and stamps. Written in black ink and ruled with red lines.